This workshop is located in Weybridge, Surrey. Adobe Lightroom was introduced in 2007 and quickly became the industry standard for editing RAW files. It is also the key to a streamlined digital workflow. Meanwhile, Photoshop allows editing at a much deeper level. We are delighted to have Adrian Beasley on board to teach our Lightroom and Photoshop courses. Adrian has been teaching photography for 15 years and digital editing for 10 years. Adrian is an Adobe Certified Expert and has a deep understanding of the software with a patient and engaging teaching style. Rachael will also be on hand to lend her advice and experience. In the morning, you will learn all the elements of the Library module to enable you to import, organise, search and export your images. We will show you from start to finish how to organise your images efficiently. You will learn how the various features of the Library module work together with the aim of being able to find your favourite images in the fastest possible way. 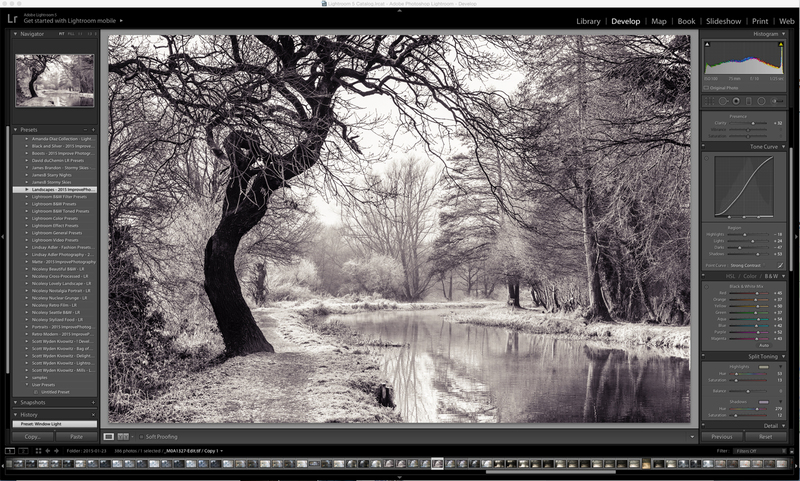 The afternoon is devoted to Lightroom's Develop module. We will teach you how to develop your own RAW images, taking complete control of your photographs. We will explore every aspect of the Develop module, including adjusting white balance, cropping, adjusting exposure, tonal alterations, mastering shadows and highlights, handling noise, using the adjustment brush, cloning, healing, and sharpening. Your post processing workflow will gain a streamlined approach and you will be amazed at what can be achieved in Lightroom without ever having to open Photoshop. Photoshop is literally the mother of all image editors. It’s seemingly impenetrable 1980’s interface can be daunting to the uninitiated. While Lightroom excels at organisation, batch processing and intuitive editing, Photoshop allows editing at a much deeper level. Fortunately, Adobe has created an integrated solution allowing Lightroom users to use Photoshop as part of their workflow. Photoshop used to be prohibitively expensive but, now, the Adobe Photography monthly subscription provides cost effective access to both, so why not get your money’s worth! The Introduction to Lightroom workshop is ideal for new Lightroom users or for those who've perhaps dabbled but feel they'd like to have a more thorough grounding in the software. The Next Steps day is suitable for Lightroom users looking to extend their Lightroom skills further in conjunction with Photoshop. It is a suitable follow-on both for people who've completed our Introductory Lightroom workshop and for people who completed our Intermediate course last year. Both courses come with a substantial supporting booklet so you can concentrate on doing the practical steps in class and scribble notes to follow when you get home. This is a hands-on workshop where you will learn by doing so you will need to bring your own computer with Lightroom Classic CC and, for the Next Steps day, Photoshop CC already installed. Ideally you will bring a laptop, but your desktop can be accommodated with prior notice. If you don’t already have the relevant software, please download the 7-day trial version shortly before the course. You will need a copy on your computer on the day. You should be reasonably confident in using your computer so we avoid too many IT issues. Please also bring, for the Next Steps day, some images to work with; examples will also be provided. The cost of this workshop is £195 per day and it includes an 80-page workbook, coffee, tea and biscuits on arrival and at breaks during the day and a sandwich lunch. To secure your place on the workshop, we take an £80 deposit payable now which you can pay by clicking the PayPal link below (no PayPal account needed). At time of booking, please send us an email to info@f11workshops.com to tell us whether you are booking both days or, if just one, which one. Four weeks before the day of the workshop, we require the balance which is payable via Bank Transfer. You will receive instructions by email.